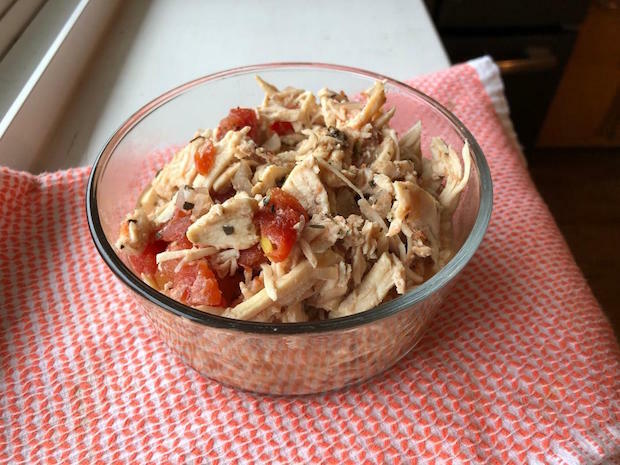 I’ve got a simple recipe for pulled Italian chicken that only has a few ingredients! 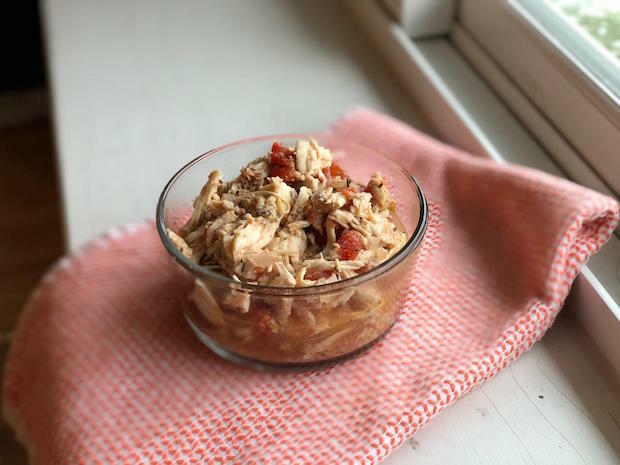 I almost hesitate to call it a recipe because it’s pretty much just putting a few items into a slow cooker and then shredding the chicken after a few hours. But hey, I’m always looking for easy recipes, so I figured I’d share in case anyone is in the same boat as me. What I love about this recipe is that it’s super customizable. Don’t like some of the ingredients? Swap them out for something else. Want to add something? Feel free! I’ve listed a few serving and variation ideas at the end of the recipe, too. 1. Place tomatoes, onion, and one teaspoon of the Italian seasoning in slow cooker and stir to combine. 2. Cut chicken breasts into tender-sized pieces and place on top of tomato mixture. Top with remaining Italian seasoning and salt and pepper. 3. Cover and cook on high for three hours or low for six hours. 4. Remove chicken and shred with two forks until it resembles pulled pork. 5. Add pulled chicken back into tomato mixture and stir to combine. Add more salt and pepper if desired. Enjoy! -Serve the pulled chicken in toasted ciabatta buns, on top of rice, on a flatbread, in a panini, over polenta, in a baked potato, or on top of mashed potatoes. -Stir the chicken into your favorite soup, risotto, or add it into a casserole. -Use the liquid from the chicken as a broth. -Use a can of Italian-seasoned tomatoes for a more Italian-esque flavor. -Go latin-inspired and use salsa instead of canned tomatoes. -Make this recipe Mediterranean by topping with black olives, mint, and feta cheese and serve it with pita bread and tzatziki sauce. -Chicken thighs also work in this recipe instead of chicken breasts, though they may take a little longer to cook. -Add-in ideas: olives, garlic, chopped bell peppers, corn, green beans, mushrooms, anchovies, capers, pesto, cheese, fresh basil, parsley rosemary, etc. I love how many options this comes with! So customizable and so simple.